Generating a token for your Netsuite account is not an easy task, especially if PieSync is the first token-based integration you've set up. There is documentation out there to help you with this, but it isn't always so straightforward. The main reference is the internal NetSuite documentation which you can find here, but we are happy to provide you a more detailed overview ourselves. In any case the most important thing to know is that you need a user with an administrator role to take most of the below steps (as access to the 'Setup' is needed). Make sure Enable Token Based Authentication is enabled for your NetSuite account. 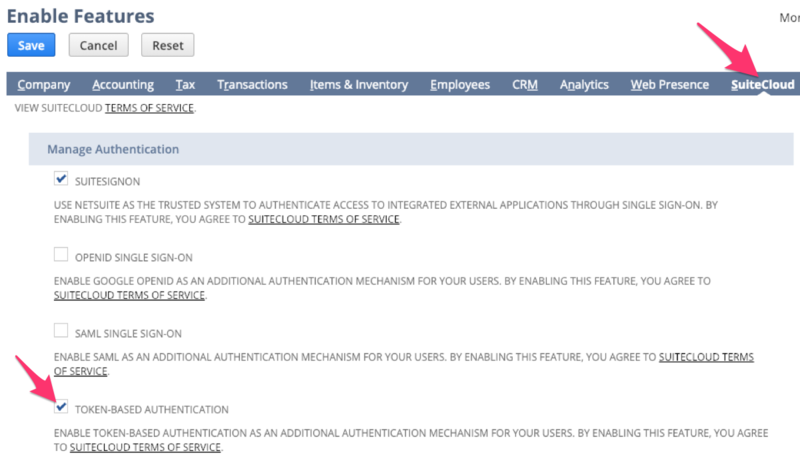 Go to Setup > Company > Enable Features > Suite Cloud > Manage Authentication and enable Token-Based Authentication. Make sure your user role allows for API access. Use the predefined 'Full Access' role. This is the easiest solution and will work fine, but it might not be ideal from security perspective. [Recommended] Create a new custom role that will be used for the PieSync integration. This can be done by going to Setup > Users/Roles > Manage Roles > New. Be sure to click on Save after assigning these permissions. Assign the role to the NetSuite user. Go to Lists > Employees > Employees > Search. Once you've located the user of your choice, you can Edit that one and then add the role under Access > Roles. Be sure to click on Save. Obtain your NetSuite Account ID. This is to be populated in the PieSync auth popup. Go to Setup > Integration > Web Services Preferences. Obtain your Consumer Key and Consumer Secret. Use the Consumer Key and Secret from an earlier integration. This should work just fine, but might not be the best option from security perspective as it is a good practice to separate different integrations for tracking purposes. Create a new Consumer Key and Secret. Go to Setup > Integration > Manage Integrations > New. Make sure that the "Token-Based Authentication" checkbox is enabled as shown on the below screenshot. IMPORTANT: The Consumer Key and Secret are only displayed once, so be sure to copy them locally! Obtain your Access Token ID and Access Token Secret. Again, there are 2 options for this, similar to the options for the Consumer Key and Secret. Use the Token ID and Secret from an earlier integration. Create a new Access Token ID and Secret. Go to Setup > Users/Roles > Access Tokens > New. Here you'll be able to select the applicable Application, User and Role. IMPORTANT: Here again, the Token ID and Secret are only displayed once, so be sure to copy them locally!